A few weeks back, we brought you all the latest info on the iPotty, the iPad compatible potty for toilet-training toddlers. Just when you thought you couldn’t be surprised by the iPad compatible children’s items on the market, we bring you this. Meet the iStroll Kid. This week, the creators of the iStroll Kid launched a Kickstarter campaign in order to raise the necessary funds to begin production. 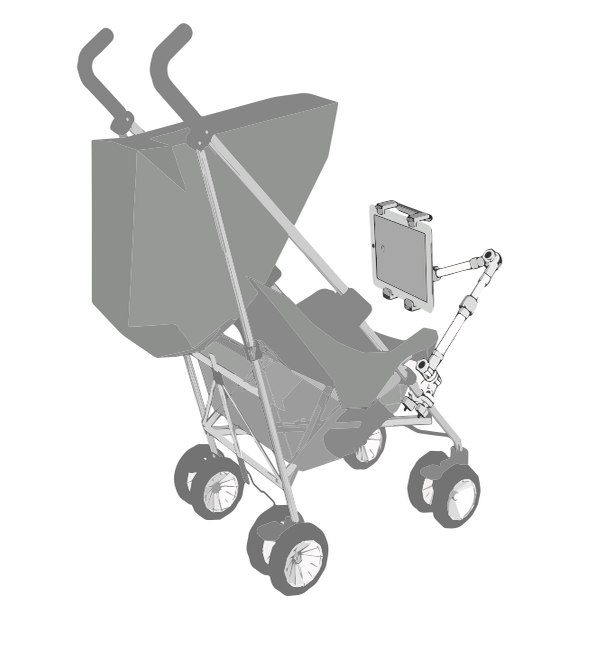 Essentially, the iStroll is an iPad stand that mounts to any child stroller to allow the child to use the iPad safely while out and about with parents or a caregiver. My six year old has seizures and is non-verbal. Last year, I purchased him the iPad and for the first time, he’s been able to clearly communicate his needs and wants. I’ve been looking for an attachment for his wheelchair/stroller since he is not able to hold the iPad and use it at the same time. This looks perfect! Now that iStroll Kid has found their way to help special needs children, they need funding to make their ideas a reality. Their Kickstarter project is all-or-nothing, so if they do not raise the full amount for their product, they don’t receive anything. Luckily, parents and supporters who donate to the cause are able to pre-order this awesome product and help fund the idea at the same time. To check out the iStroll Kid Kickstarter Campaign, click here!